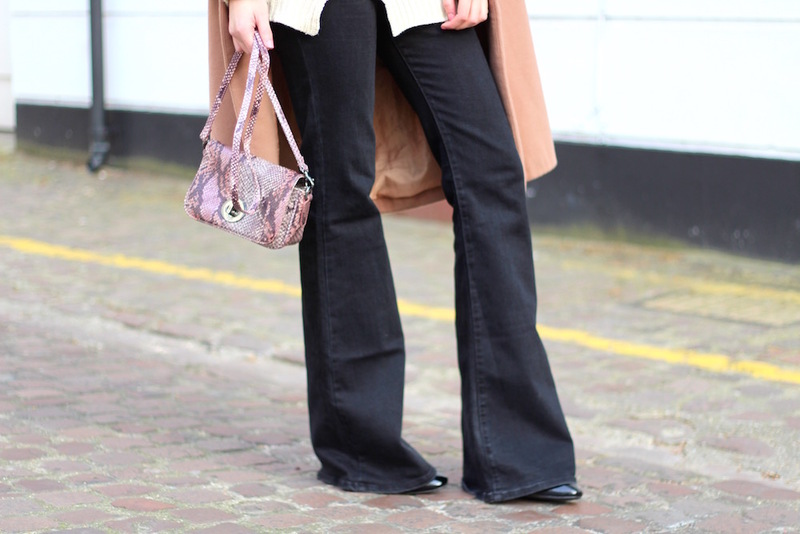 I've fallen in love with these Mango flares, now only £14 on ASOS! I was on the hunt for some flares that showed nothing but a hint of my shoes when walking and having bought these on a whim in the sale I simply couldn't be more impressed. I don't typically shop at Mango but I think I need to start going in more, it's much like Zara but somewhat cheaper. And if that wasn't enough, the flares are so exaggerated that I have to wear heels to avoid dragging around extra fabric - not so good if you're petite, but for a tall girl like me these are simply a dream come true! Paired with a chunky knit this outfit is perfect for the drastic weather change we've experienced this week (all I can think is thank goodness I did my outfit shots yesterday!) I'm majorly in love with this camel coat from Boohoo which I think you must be aware of judging by just how often I wear it! I know winter is coming to an end now so I can't really justify buying any coats but next autumn/winter my goal is to expand my coat collection and have some real staples in my wardrobe! Ahh love this outfit :) The flares look fab on you, £14 is such a bargain! Love this, I've not shopped in Mango in so long - well ever since it left Brighton! More shopping there required. Hard to beat a nice pair of well fitting flares, I used to live in this jean cut, I seem to now live in skinnys or straights. you pull off this outfit so well, love how casual but classy it is! Ahh you look AMAZING! The flares are just incredible, legs for dayssss! Can you post a link to the roll neck jumper? It's so gorgeous, cant seem to find it!